The powered turntable is used when two parallel conveyor lines must be close together with a 180-degree turn at one (or both) ends. The turning radius is held to a minimum, less than would be available with gravity or powered curve sections. Turntable plow and guard rails insure product safety while negotiating 180-degree turn. Unit is reversible and all bearings are sealed. Table top speed at drive wheel is 190 FPM. 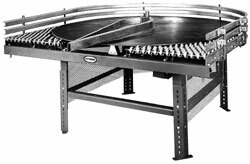 The Manually operated turntable can be placed in-line with gravity or powered conveyors. Operator can manually reposition turntable to divert pallets, product, etc. to an adjacent conveyor line. Minimum elevation to top of rollers is 8-1/2 in. Other elevations up to 40 in. available. 30-degree plows are used to divert product from main conveyor line to spur line. 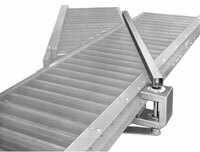 Mounts to underside of bed on powered belt or live roller type conveyors. Based on the 25/26CR conveyor with a wheel block drive system, the pivot cart rotates using a 1 hp gear-motor that can handle loads up to 3,000 lbs. 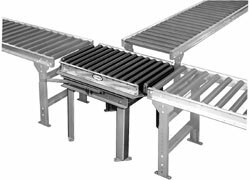 The cart moves up to 90 degrees to allow flow changes without changing the pallet orientation. The cart has bumpers on all sides that trigger a system stop at the slightest bump. Proximity switches take care of positioning the cart next to the discharge and infeed conveyors. Speeds are adjustable using variable frequency zone controllers.